It’s easy to forget which dental care products we’ve purchased over the years. It’s even easier to take the bags of complimentary goodies our dentist in Carrollton gave us after our recent dental visit and toss them in the bathroom closet for safekeeping. Since spring is around the corner, you just might have discovered these products hiding in the deep pockets of your closet or in your bathroom drawer while cleaning. The good news is most of these products are still fine to use, but you’ll need to keep a few tips in mind before you do. Your dentist hates wasting perfectly good dental products, but he also wants to make sure you’re still protecting yourself. 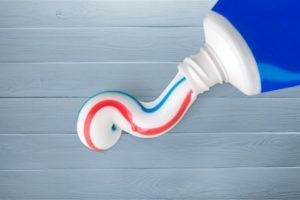 Is Toothpaste Still Safe to Use? When looking at the manufacture date, keep in mind that the FDA doesn’t mandate it based on safety guidelines. In fact, the FDA doesn’t determine it at all. The manufacturer uses their best judgement to determine when the toothpaste is past its prime. More often than not, the toothpaste will still be fine to use past that date. However, once it’s been two years past that date, the fluoride and flavor of the toothpaste will start to fade. Not only will it not taste as good, but more importantly it will be less effective at protecting your teeth and gums. If you’re in a bind it’s safe to use, but once it’s two years past the date, toss it. What Do I With All These Extra Toothbrushes? Thankfully, toothbrushes last for life when they’re not in use. This is especially true if you find them still in the packaging. There’s no reason to toss these, unless they’re particular dirty where you found them. If they’re clean, make sure that you have space brushes for when you travel. Ask your family members if they have their own spare brushes as well. As a rule of thumb, dentists recommend that you replace your toothbrush every 3 months for effective use. Should I Use Old Floss? Floss lasts forever as well, just like toothbrushes, so buying in bulk is totally fine. The only time you’ll need to consider the day is if the floss is flavored. Once it’s been 1 year past the manufacturer date, the flavor will have faded completed. At the very least, you can save the old floss for travel use if the flavor is important to you. Mouthwash typically has an antiseptic in it, such as alcohol. This active ingredient helps keep the mouthwash usable, but since mouthwash is still mostly water, the antiseptic will eventually dissolve. Therefore, to avoid accidentally ingesting any bacteria that grows, toss the mouthwash if it’s between 2 and 3 years past its manufactured date. Don’t let the date sway you entirely. Your dentist in Carrollton knows how long dental products are actually good for. Schedule an appointment with them today to learn more! Dr. Rajiv Shekhadiya earned his Doctor of Dental Surgery degree from New York University, but before that, he gained a Bachelor of Dental Surgery from the Government College and Hospital in Ahmedabad, India. Today, he provides high quality dental care to the community of Carrollton. To learn more advice on dental products and ask questions about his practice, contact him at (469) 892-6647 or visit his website.